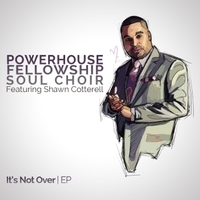 It's Not Over EP is the newest release from the Powerhouse Fellowship Soul Choir featuring Shawn Cotterell. Hailing from Toronto Canada, the Powerhouse Fellowship Soul Choir is a group of talented teens and young adults with a passion and goal to change lives though music. Fondly referred to as POWERHOUSE, the choir was formed in 1986 for a church building fund program. In 1988 the choir was officially founded and directed under the leadership of Shawn Cotterell. With thirty-five voices and a multi-talented band, the choir’s repertoire ranges from hip-hop, reggae, traditional and contemporary gospel. The director and founder of this anointed choir is Shawn Cotterell. Shawn Cotterell’s first musical experience began at the age of seven singing in a church choir. By the age of twelve, Shawn answered the call of God on his life and began organizing the Powerhouse Fellowship Soul Choir. Having a love for music, Cotterell's professional musical experience included recording background vocals for Sesame Street fame-Bob Mcgrath, Canadian Folk singer Rita MacNeil, and Sharon, Lois and Bram. Cotterell also served as an alternate Praise and Worship leader at Revival Time Tabernacle pastored by Reverend Audley James. He is currently part of the Praise and Worship team at the Kingsway Community Life Centre pastored by Richard J. Brown. Shawn’s dream is to make a lasting impact and impression on mainstream music. "I love music and I thank God for giving me this gift. My only prayer is when I use this gift, those who listen would be blessed." To witness a performance of this group is refreshing and exciting. Fueled with energetic and spirit filled performances, Powerhouse had the opportunity to grace the stage at many venues, not only across Toronto, but as far as Ottawa, Canada, Montreal PQ, Brooklyn New York, Philadelphia, Chicago and Las Vegas. (Performing to thousands at conventions concerts charities and revivals). The group has also shared the stage with gospel recording artist CeCe Winans, Pastor Shirley Caesar, Kim Burrell, Ricky Dillard and the Clark Sisters. The unique contemporary musical style of the Powerhouse Fellowship Soul Choir has been featured on City T.V’s entertainment segments, Breakfast television, CFTO television, as well as Pride Caribbean Newspaper and Gospel News magazine publications. They have also participated at the Nike Women's 15K Run,“Gospel on the Harbour” at Harbourfront centre, which was presented by CELAFI: Ottawa Blues Festival: Nathan Phillips Square: the 31st Annual Gospel Music Workshop of America (GMWA): and the 5th annual Yorkdale Canadian Designers of Distinction Fall fashion show and Awards gala. Former CFTO news entertainment host Carla Collins hosted the event. "IT'S NOT OVER LIVE" is an exciting worship experience recorded live in Toronto, Canada. This celebration features some of the best in Toronto such as Powerhouse alumni’s former EMI Gospel recording artist Londa Larmond and R&B Canadian Idol finalist Toya Alexis. “It’s Not Over LIVE” is infused with high energy and worship. Highlights include “ Angels Cry”, “Unexpected Gift” featuring Toya Alexis, the Hip-Hop fused track “The Remedy”, and the most requested hot first single “I Choose to Rejoice” featuring Londa Larmond. This is one of the most exciting gospel projects to hit the marketplace and a must have. With songs that encourage, inspire, empower and elevate.